I am a VFuel Athlete and 2:19 marathoner. I have been running since the age of 11 and have not looked back. I have really enjoyed being able to travel and have such great experiences as an athlete. I am lucky to have great family and sponsor support, which has made it possible for me to keep me in the sport. As everyone knows it's hard to make a living as a runner, but I have been blessed with a drive and determination to push the limits in whatever it is I do. I enjoy discovering new places that I may never have seen or visited if it wasn’t for my running. I am also a husband and father of two. Alden is 20 months and Leeim will be born later this summer. I have a full time job working as a Precious Metals Clerk in Corning, NY at the World Kitchen Inc. Plant. The job carries a lot of responsibility. What I do on a daily basis determines whether or not the plant will be able to run. I typically run anywhere from 80-120 miles a week depending on the week. I live a very busy life, but I am very well supported and I have a great family that allows me to train when I need to train. I feel very blessed to do what I have done to this point, and look forward to more success (along with some inevitable failures along the journey) as I try to be the best dad, husband and runner that I can be. Guilty Pleasure: Energy Drinks and Doritos! Other Hobbies: Traveling, camping and spending time with my wife and son. Best thing about VFuel: Taste Good, and is Crucial to my training regime, I do not leave the door without one. I also consume one every day at work! Best recovery meal: Dr. Pepper or an energy drink and some pasta. Favorite running memory: Winning my first marathon. 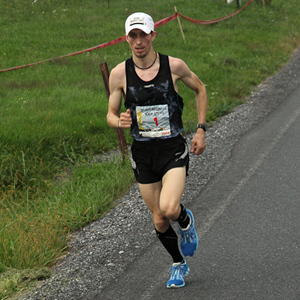 #1 Running goal for 2014: Qualify for the 2016 US Olympic Marathon Trials and Run Sub 2:20.